Find out about solar energy in Saskatchewan fromSkyFire Energy from 6:30-8 pm, Nov. 1, at the Regina Science Centre. Sandra Moore will discuss regional approaches to energy diversification at the Nov. 7 breakfast meeting of SK Energy Management Task Force. Everyone is welcome to attend Walking Saskatoon’s meeting from 1-2:30 pm, Nov. 4, at Tastebuds Café, 1624 Lorne Avenue. Discussion topics will include infill housing, loss of traffic safety revenue, and progress on Vision Zero. Tour Radiance Cohousing, a cohousing project pursuing Passive House certification, on Nov. 10. First Nations Power Authority is hosting the 4th annual Indigenous Green Energy Forum from 8 am-4 pm, Nov. 21, in Saskatoon. Participate in EcoHack, Nov. 23-25 at the U of S, and help solve local environmental and sustainability challenges. SaskOutdoors is hosting a Wilderness & Remote First Aid Workshop Nov. 30-Dec. 2 (location near Saskatoon). University of Saskatchewan environmental law professor Jason McLean says we should kill Bill C-69 as it undermines efforts to tackle climate change. The alternative? "Canada should assess all economic projects on the cumulative basis of a “net contribution to sustainability test.” If a proposed project doesn’t make an overall contribution to sustainability and decarbonization, then it doesn’t proceed." 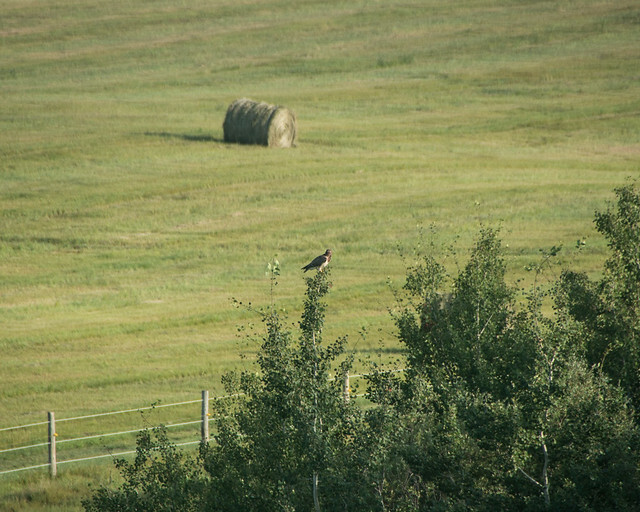 EcoSask News is a weekly round-up of local news and events. Email us if you have items you would like us to include. You can follow EcoFriendly Sask by liking us on Facebook, following us on Twitter, or by email (top right corner). Teachers are encouraged to take their students outside for at least an hour on Oct. 24, Take Me Outside Day. Anthropocene, a cinematic overview of humanity’s reengineering of the planet, is being screened at the Roxy Theatre on Oct. 26. Check for the book, with photographs by Edward Burtynsky, in your local library or bookstore. Jean and Peter Ascroft will share their travels south of the equator on two continents at the 7 pm, Oct. 27, meeting of the Fort Qu’Appelle Nature Society (at the Fort Qu’Appelle Train Station). 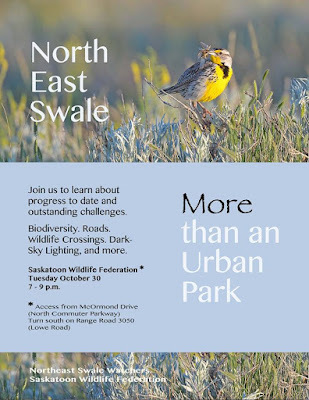 Join the Northeast Swale Watchers from 7-9 pm, Oct. 30, to learn about the Northeast Swale, progress to date, and ongoing challenges. There will be 5 short presentations: Renny Grilz, Meewasin, What's in the Swale: The Unique Wildlife and Plants of the Northeast Swale; Dr. Ryan Brook, University of Saskatchewan, Monitoring and Mitigating the Impacts of Roads on Wildlife; Rick Huziak, Sask Light Pollution Abatement Group, Reducing Night Lighting for a Healthy Swale; Brenda Wallace, City of Saskatoon, Protecting What Matters - Policy Perspectives; Candace Savage, The Last Refuge: Why Protecting the Swale Matters. You can dispose of household hazardous waste in Saskatoon from 8 am-2:30 pm, Oct. 28. 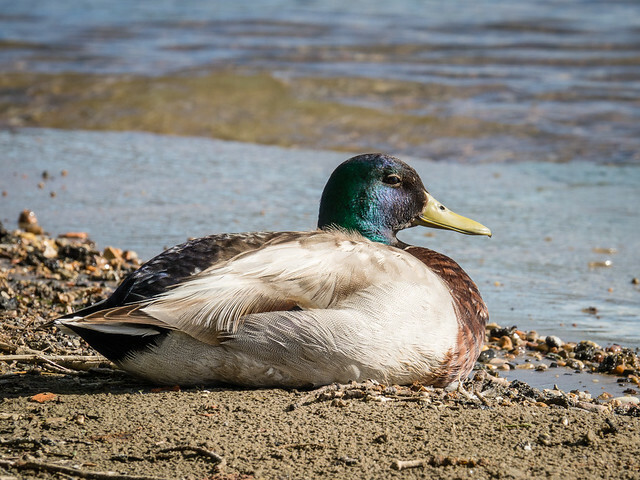 Join Nature Regina from 10 am to noon, Nov. 3, on a birding field trip at Lakeridge Park. Saskatoon’s Library of Things is hosting a volunteer orientation from 12-1 pm, Nov. 3. Turtles survived the asteroid that wiped out the dinosaurs, but will they survive the Anthropocene? Where have all the turtles gone and why does it matter? 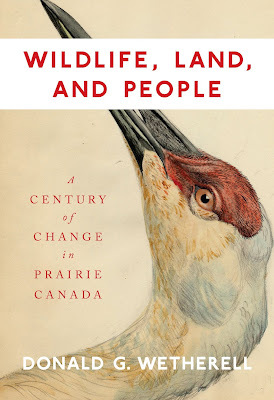 It’s a hefty tome, but we’re intrigued by the premise behind Donald G. Wetherell’s book, Wildlife, Land, and People: A Century of Change in Prairie Canada. The book examines the relationships people have had with wild animals on the Canadian prairies between 1870 and 1960. Here are just a few excerpts from the Introduction. If you’re interested in environmental history and the changing, complex relationships between humans and non-humans, you can order the book from your library or bookstore. Grade 7 students in Yorkton can visit the Smarter Science, Better Buildings exhibit at the Western Development Museum from Oct. 15-Nov. 12. Regina's Blue Dot Movement and some of Regina's City Councillors are hosting a panel discussion on making Regina 100% renewable by 2050 from 7-8:30 pm, Oct. 16. Take advantage of a one-month pilot project to recycle infant seats, convertible seats, and booster seats in Regina and Saskatoon starting Oct. 17. 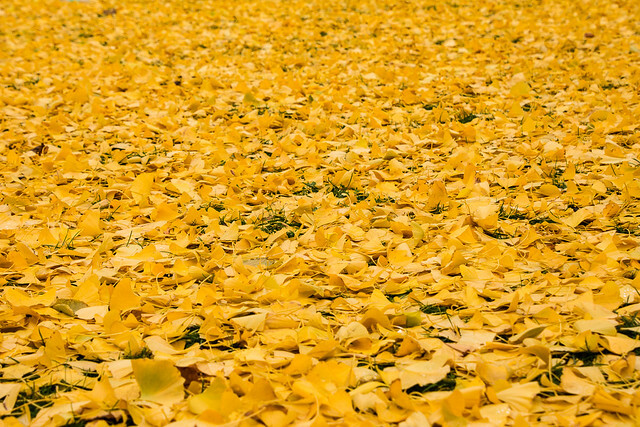 Participate in a nature immersion walk from 1-3 pm, Oct. 18 or from 1-3 pm, Oct.19. Join the U of S Office of Sustainability from 12-1 pm or over a pint at 5 pm, every third Friday of the month. Join the Prince Albert Permaculture Guild at 7 pm, Oct. 23, as they package seeds for the Prince Albert Seed Library. 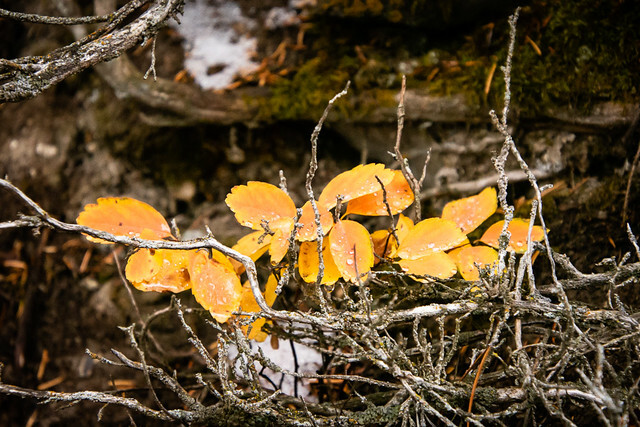 Join Nature Conservancy of Canada at 7 pm, Oct. 24, for a discussion about our complicated relationship with nature and how it stands to impact our future. Obtain a 40% reduction when you register with the promo code NCCFRIENDS. Cinema Politica Regina is showing two films about Standing Rock at 6:30 pm, Oct. 24. Learn about the City of Regina’s recycling and waste reduction/diversion plans at a lunch & learn at Innovation Place at 12 pm, Oct. 24. 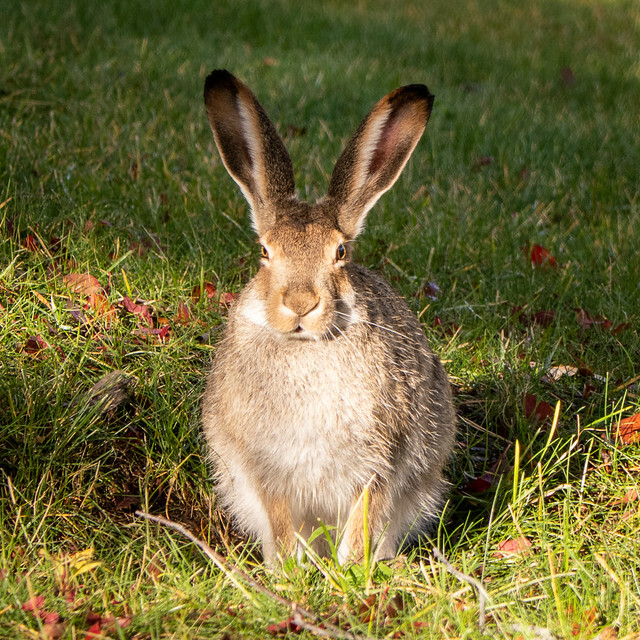 Kids will enjoy meeting live animals and making spooky discoveries at the Wascana Spooktacular, 12-3 pm, Oct. 27. Celebrate International Bat Week at the Beaver Creek Conservation Area from 12-5 pm and from 6:30-11 pm, Oct. 27. 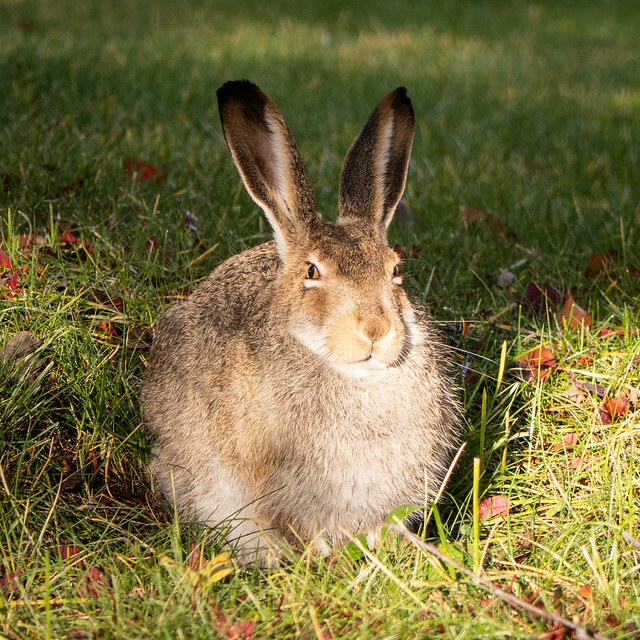 Meet some nocturnal animals and view the night sky. Book your spot now for the evening event as registration is limited. Birds of Saskatchewan by Alan R. Smith, Stuart C. Houston, and J. Frank Roy is now available from Nature Saskatchewan. The 800-page, full-colour book provides a comprehensive compendium of Saskatchewan’s birds. Receive a discount by purchasing before December 15. Spiders with 8 eyes, eagles that can focus on two objects simultaneously – no two animals see the same thing. Here are just a few examples. Talk about eyes in the back of your head! 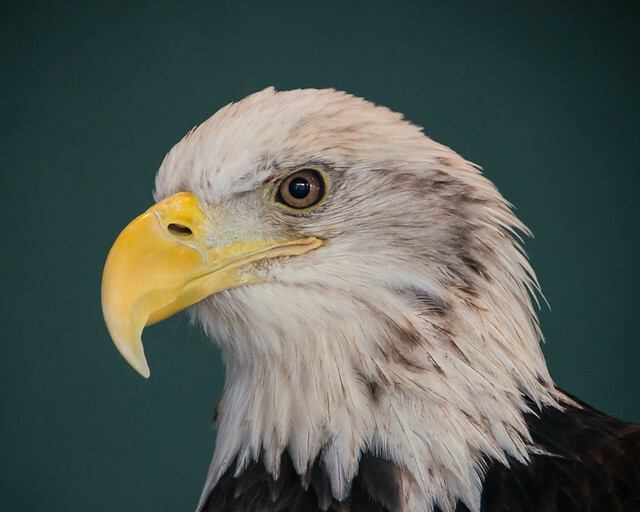 Eagles can focus on objects in front and beside them at the same time thanks to having two centres of focus. Their eyes are four times as sharp as human eyes. From a fixed position at 1,000 feet above the ground, they can spot prey in an area just under 8 km squared. An inner eyelid, called a nictitating membrane, slides across their eye every few seconds to wipe away dust or dirt. 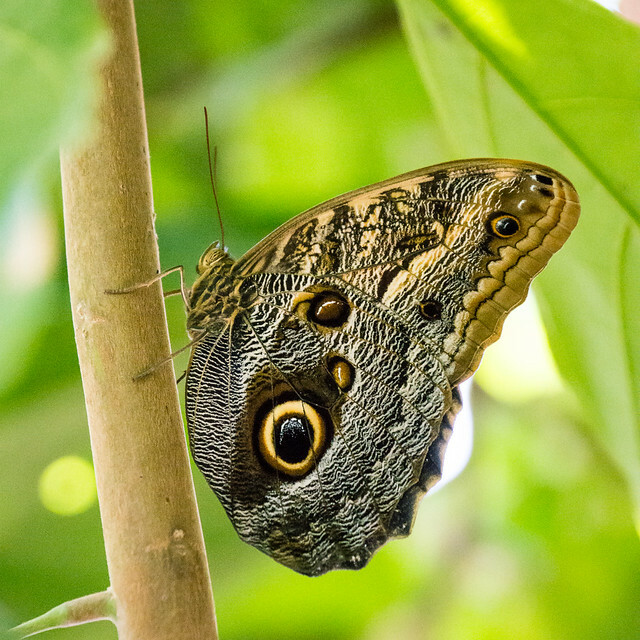 Some butterflies and moths have colourful patches on their wings that resemble eyes. Scientists speculate that they are used to frighten or distract potential predators. Owl butterfly have a bad reputation for getting drunk on fermented fruit. 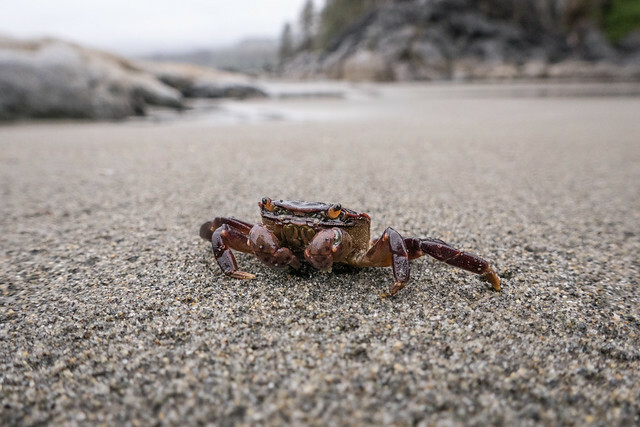 Fiddler crabs have almost-perfect all-round vision but, because their eyes don’t move, they use different parts of their eyes in different ways. Their sharpest vision is immediately in front of them and is used to identify and communicate with potential mates. Their overhead vision is limited to perceiving light and dark but is more than adequate for recognizing a seagull swooping down from the sky. 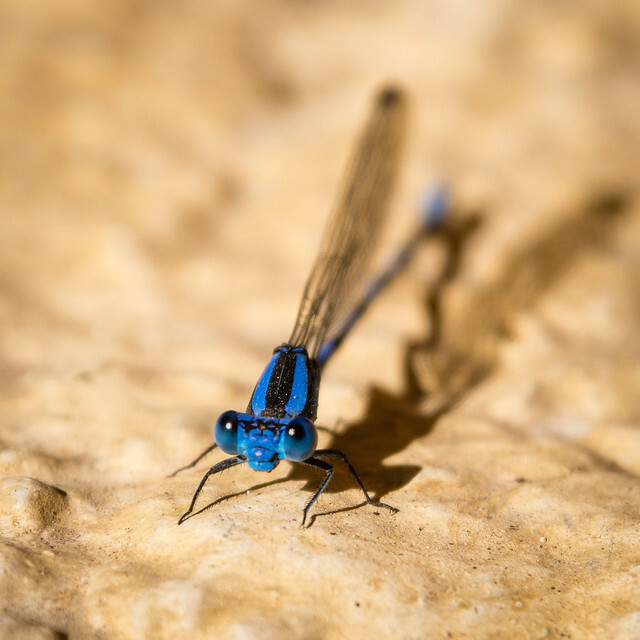 Huge eyes take up most of the space on dragonflies’ and damselflies’ heads. By piecing together images from their 20-30,000 individual lenses, they can see what’s happening all around them, essential for locating and capturing prey while hovering in mid-air. They also have 3 simple eyes on their forehead that can detect light intensity. 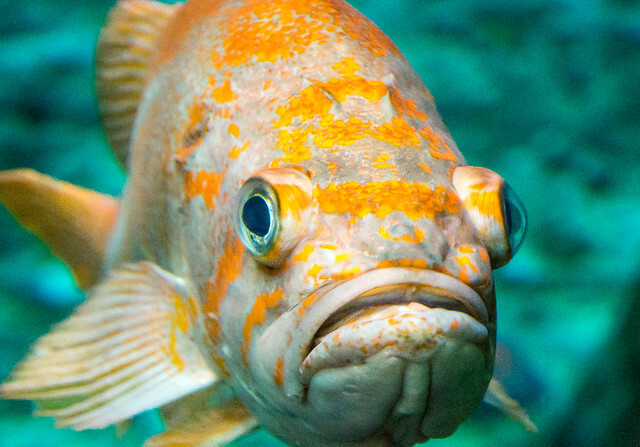 Fish can’t close their eyes as they don’t have eyelids. Some have transparent nictitating membranes they can pull down to protect their eyes, while others have light-activated pigments in their eyes that turn darker when exposed to a bright light. Now this is amazing! 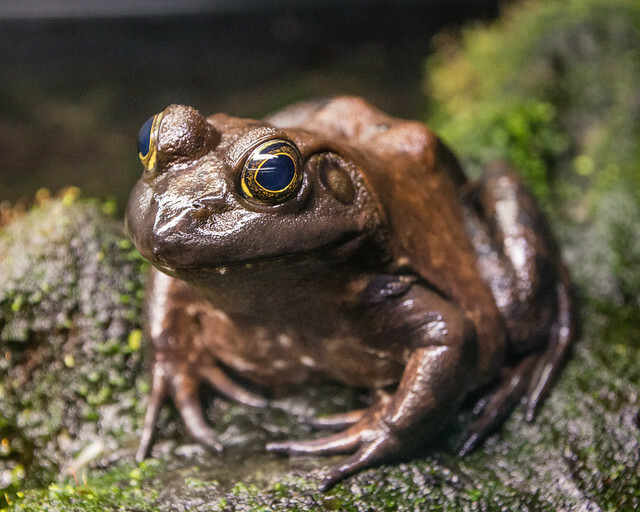 Have you noticed that frogs and toads shut their eyes when eating? Their eyes actually move backwards, helping the tongue to push food down their throat. Owls’ eyes are shaped like tubes rather than spheres and are fixed in place, but they can turn their necks up to 135 degrees in either direction. 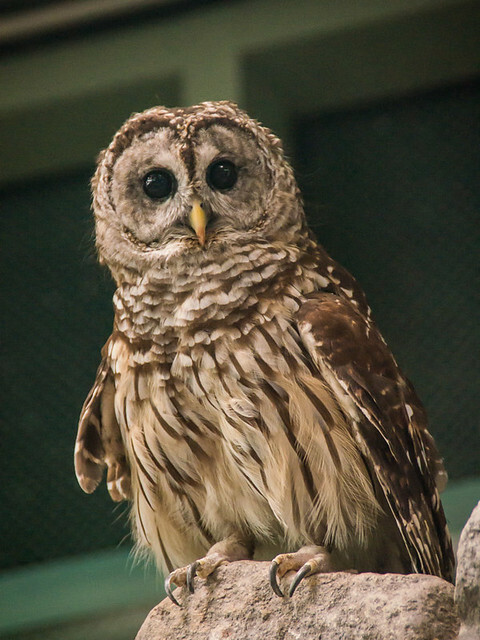 A large retina and an abundance of rods ensure that owls can take advantage of whatever light is available at night. The rod cells are connected differently than human rod cells so they’re able to pick up edges, movement, and silhouettes in dim light. 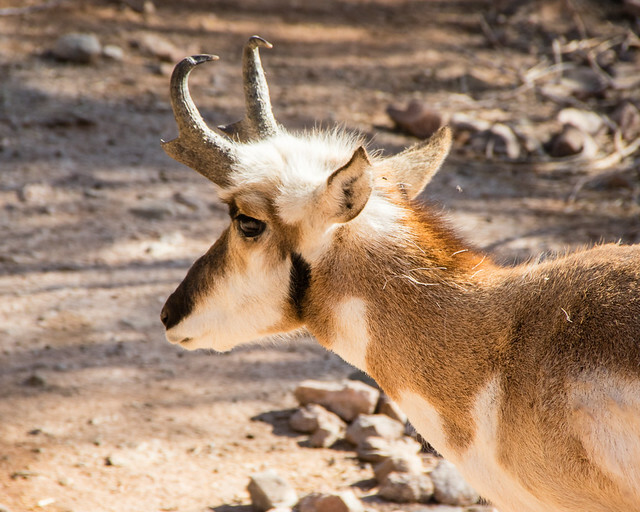 Pronghorn have large eyes (36 mm in diameter) near the back of their head. They can spot movement up to 6.5 km away and can view objects within a 300-degree arc without moving their head or eyes. Back 40 Wilderness First Aid Training is offering an overnight camp and basic wilderness first aid course on Oct. 13 & 14 near Saskatoon. Watch Wasted: The Story of Food Waste at 7 pm, Oct. 15, in Regina. Dr. Amber Fletcher, University of Regina, will explore how women and men are affected by climate disaster and how paying attention to gender can help strengthen our resilience to future climate events at the 7:30 pm, Oct. 15, meeting of Nature Regina. Learn how to compost in your own backyard at 7 pm, Oct. 16, at the John M. Cuelenaere Library, Prince Albert. U of S Professor Vikram Misra will speak on prairie bats and white-nose syndrome at the 6:30 pm, Oct. 17, meeting of the Moose Jaw Nature Society. Explore the universe with the Royal Astronomical Society from 7-8:30 pm at the Sunrise Branch, Regina Public Library. Leslie Tuchek will discuss Douglas Tompkins' work in establishing a sustainable land trust in Argentina and Chile at the 7:30 pm, Oct. 18, meeting of the Saskatoon Nature Society. The Build Sask Green conference will be held in Saskatoon on Oct. 18 and will include sessions on zero carbon building standards and applications. Wildernook Fresh Air Learning is hosting Nature Playcare for 3-4 year olds from 1:30-3:30 pm, Friday afternoons from Oct. 26 to Nov. 30. Children should come dressed for the weather ready to immerse themselves in play-based learning in a natural environment. Grade 7 classes and the public are invited to visit the Smarter Science, Better Buildings exhibit in Prince Albert City Hall’s foyer from Nov. 13-16. 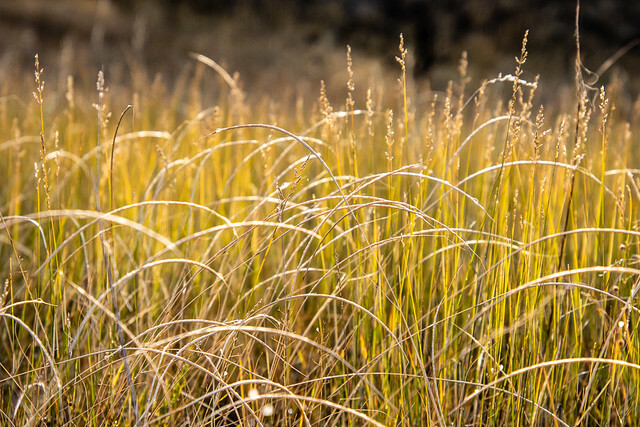 Join SaskOutdoors for a Project Wild workshop on Oct. 28 in Saskatoon. 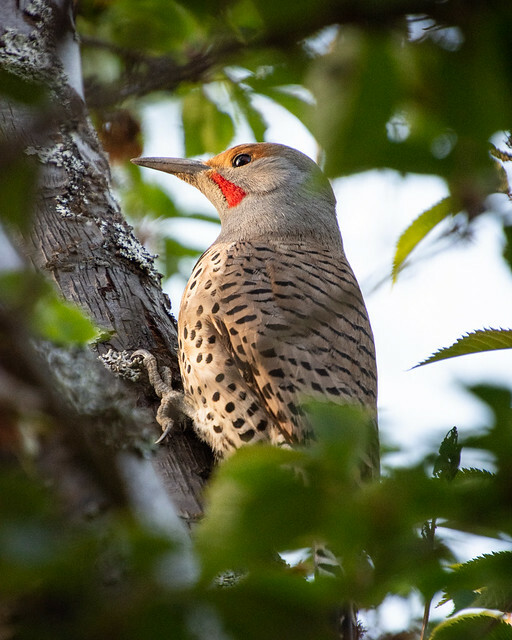 Retirees and partners who are interested in birds and the natural world are invited to participate. Everyone is welcome. 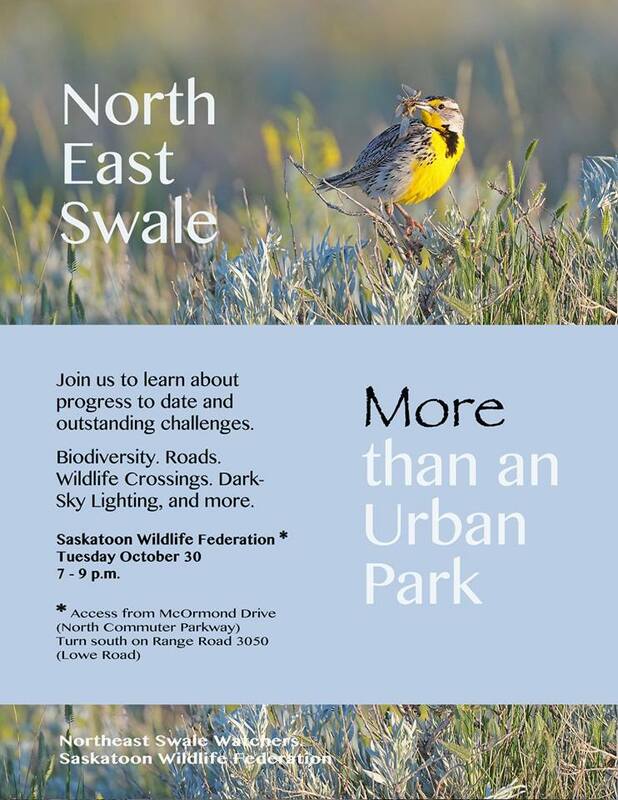 Check the Saskatoon Nature Society’s website for full details and updated information. Kirsten Palmier, MSc candidate at the U of R, will discuss bees and pathogens in a noon-hour webinar on Oct. 9. The U of S Office of Sustainability has a whole range of activities (art, food, cycling, waste, and more) planned for Campus Sustainability Week, Oct. 9-12. Learn what happens to waste and recycling from 7-8 pm, Regina Central Adult Public Library. Find out more about the Library of Things and ways to get involved at their fall meeting and potluck supper at 6 pm, Oct. 11. 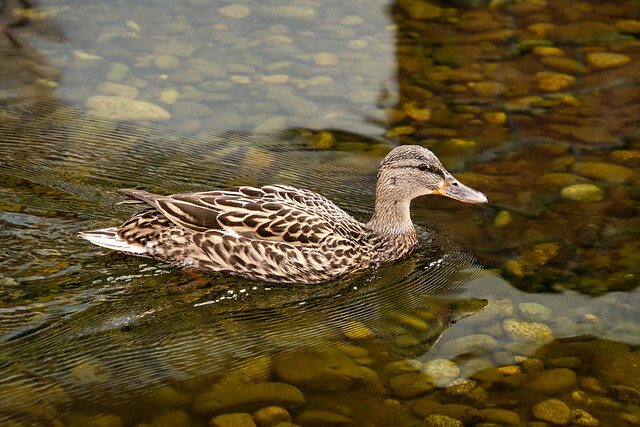 Join Regina Nature for a field trip to Wascana Marsh and Lake from 9-11 am, Oct. 13. Wild Birds Unlimited is hosting a trip to observe falcons catching their food. Meet at 3:30 pm, Oct. 14. The 2018 Rob Dumont Energy Management Awards Dinner will be held on Oct. 15. Tickets are available on Picatic. Attend Just Transitions in Regina Oct. 27 & 28 to discuss the possibilities and pathways for transitioning Saskatchewan's economy to renewable energies. The teacher-focused breakout group will discuss possible frameworks for teaching about a just transition using the Saskatchewan curriculum from 1-2 pm, Oct. 28, during the Just Transitions conference. Building Enclosures for High Performance Buildings is a one-day course offered by Passive House Canada on Nov. 15. The City of Saskatoon's Green Strategy is long overdue, but action must match policy. 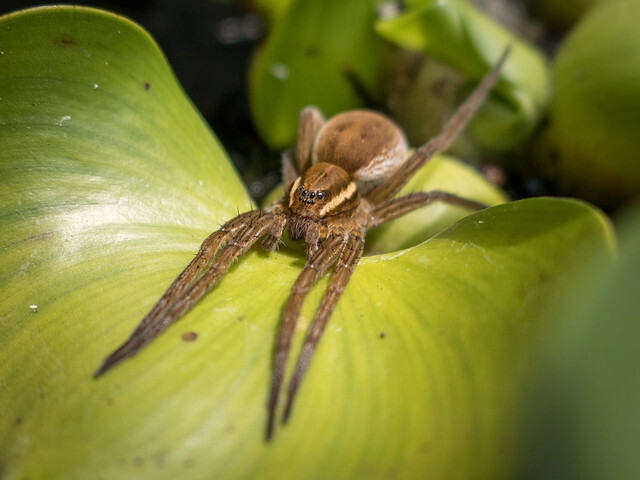 It's fine to talk about conserving biodiversity and increasing interconnections, but it falls flat in face of City Council's refusal to lower speed limits through the Small Swale. The City of Saskatoon has adopted Vision Zero. The challenge now is to make sure it works by designing streets to protect cyclists and pedestrians. 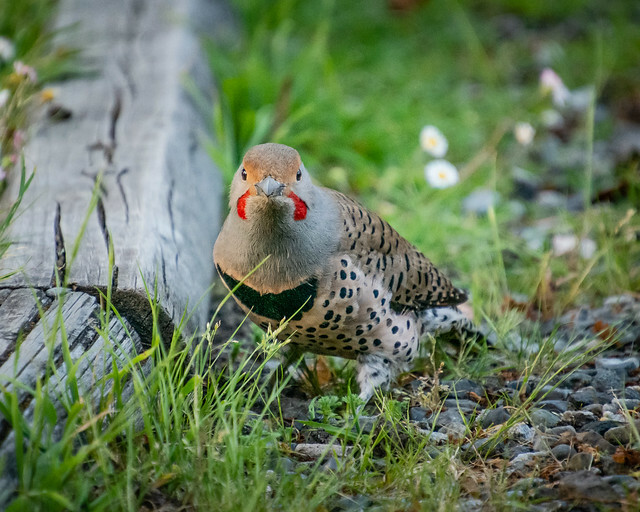 Could we use LED lights to avoid bird collisions with planes, buildings, etc? And, for the techies in the crowd, how and why to build a low-tech website.